On the heels of the announcement that he is a 2009 Kennedy Center honoree, Dave Brubeck wrapped up a rare extended club engagement, part of his latest western tour. Sunday, at the helm of the “new” edition of the quartet he has headed since 1951, the 88-year-old pianist and composer played to a packed house for the final set of a four-night engagement at Seattle’s Jazz Alley. Brubeck has come a long way in his recovery from a viral infection that put him out of action last spring. In conversation earlier in the day, he mentioned lingering tiredness and discomfort in his hands. Neither was apparent that night. Weariness dropped away after he made his greeting announcement and settled onto the bench for “C-Jam Blues,” initiating a Duke Ellington medley. To some listeners who live in the past, the Brubeck Quartet will always be the one with alto saxophonist Paul Desmond, bassist Eugene Wright and drummer Joe Morello. That group disbanded in 1967. Desmond has been dead since 1977. The new quartet is not new. Drummer Randy Jones has been with Brubeck for 30 years, saxophonist Bobby Militello 28, bassist Michael Moore a mere nine. Renowned for pieces he has written, Brubeck didn’t get around to playing any of them until he and the band entertained one another and the audience with the Ellington medley and a couple of great American song book items. He slid from his spare solo on the blues into “Mood Indigo” and segued from there to “Take the ‘A’ Train,” a central part of the quartet’s repertoire since his Jazz Goes To College days of the 1950s. At Jazz Alley, the vigor of Militello’s attack and uses of key modulations distinguished a solo that set Moore up for the first of three solos in which he used the bow to virtuosic effect that seemed to rivet Brubeck, Militello and Jones. Throughout the evening, the band listened intently to one another, exchanging smiles and glances at meaningful moments. It is an endearing characteristic of this group; without wearing their regard on their sleeves, they don’t mind letting it be obvious that they dig each other. The attentiveness and fellow feeling rub off on the audience. “‘A’ Train” cooked along on Militello’s energetic solo, gained steam with the riff figures Brubeck set up and came to an abrupt conclusion with a Jones drum tag that could not have been more definite. Then came a staple from Brubeck’s fund of cherished standards, “These Foolish Things. ” He opened it with an unaccompanied chorus into which he managed to fit the “She may get weary, women do get weary” phrase from “Try a Little Tenderness.” That unlikely interpolation clearly surprised and amused Moore. Brubeck began “Stormy Weather” alone, melding into a steady 4/4 left-hand swing that set up Militello for a couple of choruses that disclosed the blues core Harold Arlen put into the song. The only Brubeck composition of the evening came halfway through the set. It was “Dziekuje (Thank You),” which he wrote in gratitude to Poland for giving the world Chopin. His playing was soft almost to the edge of silence, and he built intensity in his solo not through volume but through development of the piece’s exquisite chords. Militello elevated the concentration of feeling, then the quartet brought the piece back to earth. Next, were they really going to play “Melancholy Baby?” No. That was just Brubeck’s eccentric choice of a few bars to introduce another song that’s almost as old. “Margie” (1920), as modern jazz players as various as Jimmy Rowles and Miles Davis knew, has great chords to blow on, and that’s what the quartet did, with Moore delivering a stunning pizzicato solo. Brubeck must have heard thousands of drum solos on Desmond’s “Take Five” since the first one by Morello in 1959. But after he and Militello worked out on the tune and Jones began developing chorus after chorus in his solo, Brubeck leaned forward on the piano and paid attention to Jones’s permutations, now smiling, now nodding agreement at some variation. It was a fine solo. Brubeck absorbed it. His concentration on the music, his enjoyment of that moment, spoke volumes about what keeps him going in the fullness of his ninth decade. Doug, we’re all glad you were there to write so memorably about this significant event in the history of the music. As Jazz Alley no doubt have told you, ALL the Brubeck evenings there were sold out weeks in advance. I was one of the additional thousands who didn’t even try to get in. Doug, Thanks so much for this writeup! I have been a Brubeck fan for nearly 50 years and I can’t put into words what his music has meant to me. I think his forte is his compositions but he has played many unforgettable solos along the way. One of our National Treasures. Doug, I experienced Dave’s interest in a very personal way a couple of years ago. A friend of his who lived near him had passed away, and the family and friends had a memorial gathering under a large tent in their backyard. Carmen Leggio’s quintet provided the music. Dave arrived as we were setting up. He got a chair and sat down right in front of us, and listened to every note we played with the greatest attention and empathy. He was one of the best audiences I’ve ever had. In his concert in Sacramento last Friday, I was so encouraged to see how much energy Dave had in light of his very difficult year. The quartet played a similar set to the one you saw, perhaps a little shorter since the Brubeck Insititute Quartet opened. One difference was after the encore (“Show Me The Way”), Dave played a few bars of “Lullabye” a tempo. Then Bobby joined in on flute and they teased each other with who would play the next phrase and when. It was fun. Sleepy though he may have been (and though he may have made us), Dave didn’t seem to want to leave the stage, even though he told the audience earlier that he had an afternoon gig in the bay area the next day and would hit the road right after that for Monterey. So he broke into one more song… I think it was “Shanty Town.” Just Dave and the rhythm section. Dave demonstrated his fondness for the place where he grew up many times during the night. He told the audience the story about buying his first 78 record at the Sherman Clay store here in Sacramento. He talked about taking the ferry to San Francisco on “senior cut day.” That’s when he found out about beer, he joked. He didn’t drink any, mind you, just found out about it. The crowd ate it up. For me I think the tune that summed the night up pretty well was “Travellin’ Blues.” I recall hearing them play it last time they were in Sac, but this time it carried some extra weight. In fact after the tune, Dave recited some of Iola’s lyrics to the audience. It was kind of like he was educating the audience a little about the jazz life, and his in particular. And a special day it was! I was in the front row Saturday afternoon in Redwood City for a concert promoted by San Jose Jazz, the promoters of the San Jose Jazz Festival. And I just finished listening to the broadcast on KUSP of the Monterey Festival performance. 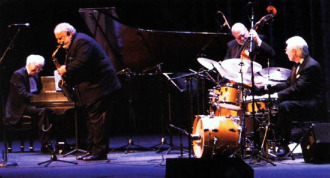 In both cases, the quartet played a set rather similar to the one on which Doug reported, but with important differences. In Redwood City, preparing for Monterey, Dave called several tunes from Time Out, beginning with “Three to Get Ready and Four to Go.” The next tune (I’ve forgotten which) sent bassist Michael Moore looking for the music, and in the interim, Dave played a lovely solo version of Strange Meadowlark. The music was never found, and Dave wondered aloud what the piece might sound like without bass, but decided that he didn’t care to know. Next up was Blue Rondo Ala Turk, which Dave described as the most difficult piece he had ever written for himself, and Take Five. Show Me the Way to Go Home (which my Dad sang to me as a lullaby more than 65 years ago, was the encore, followed by a half chorus of Brahms’ Lullaby. The first half of the Monterey set was similar to Seattle, Sacramento, and Redwood City. After the slow ballad with Millitello on flute (probably a Brubeck original) that they had played in Redwood City, Dave launched into a magnificent version of Yesterdays that was the highlight of the two sets I heard. Then Take Five, and off the stage. In his 89th year, Dave seemed full of energy, both at the piano and when he stood to chat with the audience between tunes. He was clearly enjoying every minute of it, and so did we.